Mexican Lettuce Cups with Shrimp…perfect for summer! This delicious and light (but filling) recipe is perfect for summer meals. The 3-Bean salad can be eaten by itself as a side salad. The recipe is easy…combine all ingredients in a large bowl and refrigerate. 20-30 medium shrimp, boiled, peeled & cleaned (chilled). On each lettuce leaf, spoon 2-3 Tbs of the 3-Bean salad and then add a shrimp (or 2!) on top. For a little extra interest, add a squeeze of lime over the whole cup. Beat the egg lightly with a whisk. Beat in the beer, then dry ingredients, whisking until smooth. Cover and let stand for 25-30 minutes. Cut chicken breasts in half lengthwise. Heat oil in 10 inch skillet over med-high heat until oil reaches desired temperature of 360 degrees (or use deep fryer). Using tongs to hold chicken strips, dip in batter; allow excess to drip off. Remove & carefully lower, one by one into the hot oil. Turn after about 1 minute & continue to turn until golden, cooking for a total of 4-6 minutes. Transfer to paper towel lined tray. Need to try variations of this with spices, chipotle, ancho, Tony’s…perhaps more beer. DELICIOUS, ORGANIC AND EASILY ADAPTABLE TO EVERY FAMILY MEMBER’S TASTE! I am sharing a basic, vegetarian version. Measurements for the vegetables are approximate and you can certainly substitute and/or increase/decrease the amounts to your liking, see below for some suggestions. Cook time 8-12 minutes depending on pasta used. Prep time 20-30 minutes if you have a 2 year old & a husband helping! Toss all ingredients together and put in a large, covered dish in the refrigerator. Easy! Pasta: fusilli, penne, and shells all work great! 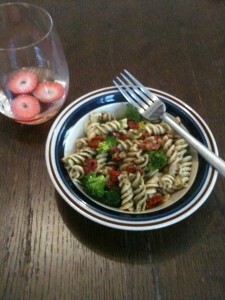 I used organic tri-color quinoa fusilli pasta. Also try gluten-free if you or the kids have a sensitivity! Protein: Sliced hardboiled eggs on top! Delicious & still vegetarian! Omnivore-style: I’ve done grilled organic boneless skinless chicken breast cut into 1/2 inch cubes and set aside in a separate container to add in for the adults when desired. This would also be delicious with some chorizo or pepperoni, even ham (all of which we currently have in organic form in our refrigerator). Carrots: Finely chopped fresh baby carrots would add additional sweetness and crunchiness. Peppers: Substitute or add in red, orange and yellow bell peppers for color and variety! Mushrooms: I personally don’t care for mushrooms but you can easily add some fresh button mushrooms, cepe mushrooms or virtually any other into this dish. Pine Nuts: Since we have a not yet 2 year old, I did not add pine nuts, although they would bring great additional flavor. Put 1/3-1/2 cup in the food proceessor to REALLY integrate it into the pesto mixture, but simple pine nuts sprinkled on top of each dish are lovely as well! Garlic: I LOVE garlic and so does my husband! For those of you in the same category, feel free to add 2, 3 or more cloves of chopped garlic to make this dish really zippy! *I used 2 packages of Simply Organic’s Sweet Basil Pesto Sauce mix http://www.swansonvitamins.com/SMP002/ItemDetail for my pesto, but feel free to use a jar of pre-made pesto, organic or whatever you’d prefer. For each packet of the mix you will need 1/2 cup water, 1/4 cup olive oil and 1/3 cup grated Parmesan cheese. **This one ingredient can really make or break the dish! I used basil-marinated sun-dried tomatoes that I picked up at our local Marche Provencal in Antibes, FR. I realize that this is not an option for most, so I would suggest finding a sun-dried tomato that you know you prefer prior to putting it into this dish. In the States I always preferred the sun-dried tomatoes in the plastic ziploc-type bags versus the ones packed in oil. In my experience I like the “dryer” version over the oily version, especially in a dish that already has a lot of olive oil. This is a very easy dish to make and requires little prep time. Preheat your oven to 375F (190C). In a corning baking dish, place your chops with enough room between and around them for apples. Place one layer of apples around the chops and on the bottom of the dish. Coat the apples with the cinnamon-sugar mix with a generous portion. Add a second layer of apples and coat with another generous portion. Add one final layer of apples topped with cinnamon-sugar mix. Pour the raspberry chipotle sauce over all – the chops and the apples. Top with raisins. Bake for 35 mins. Remove and check to be sure pork is cooked. SUGGESTIONS AND VARIATIONS Slight variation for more flavor, you might consider marinating the chops overnight in the chipotle sauce and place in the fridge.